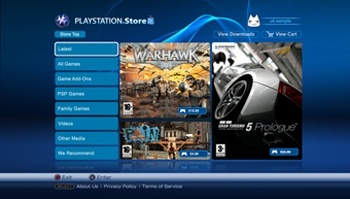 A post on the European PlayStation blog outlines the features of PlayStation Plus. Free games, discounts, and downloadable content are just some of the things that subscribers to Sony's premium PSN service PlayStation Plus can expect. PSN Product Manager James Thorpe gave a thorough breakdown of the service in a post on the PlayStation blog, giving European gamers a taste of what they can expect. In exchange for their cash, Sony gives subscribers four free games to download each month: One PSN game, two minis, and a PS One Classic. Thorpe confirms that access to these free titles requires an active subscription, but adds that the games will reactivate when a lapsed subscription is renewed. Members will also get free avatars, themes and selected downloadable content, which will be theirs to keep regardless of their subscription status. The DLC will change on a monthly basis, with the Steel & Titanium pack for Killzone 2 offered in the first month, and the Adrenaline pack for Motorstorm: Pacific Rift offered in the second. Aside from all the free content, subscribers will be able to schedule their PS3 to switch on automatically and download and install updates for their games. It will also download firmware updates when available, but those will require a manual installation. The service will not include cross-game chat, which will disappoint some, but Thorpe said that PlayStation Plus was an evolving service and that Sony would look into any suggestions. PlayStation Plus launches in Europe on June 29th. The service will cost Â£11.99 for a three month subscription, or Â£39.99 for a full year.